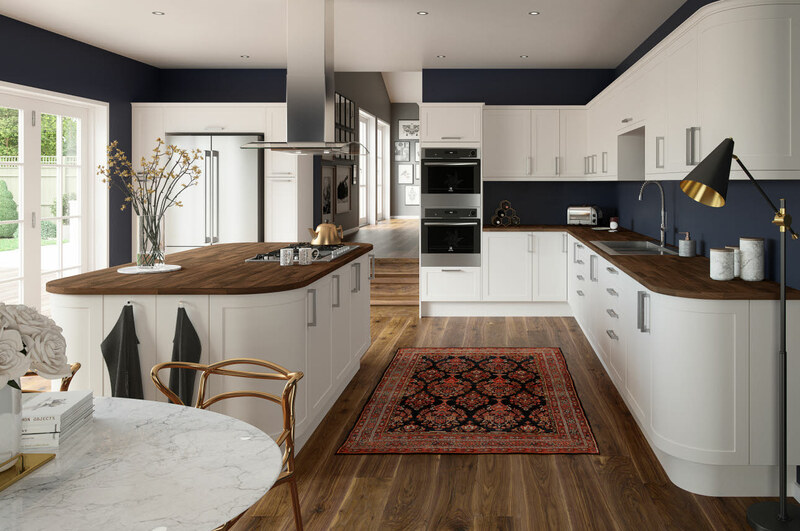 Your local Magnet Trade offers over 50 kitchens ranging from Rigid to Ready to Assemble - with every style from cutting edge contemporary to timelessly traditional. 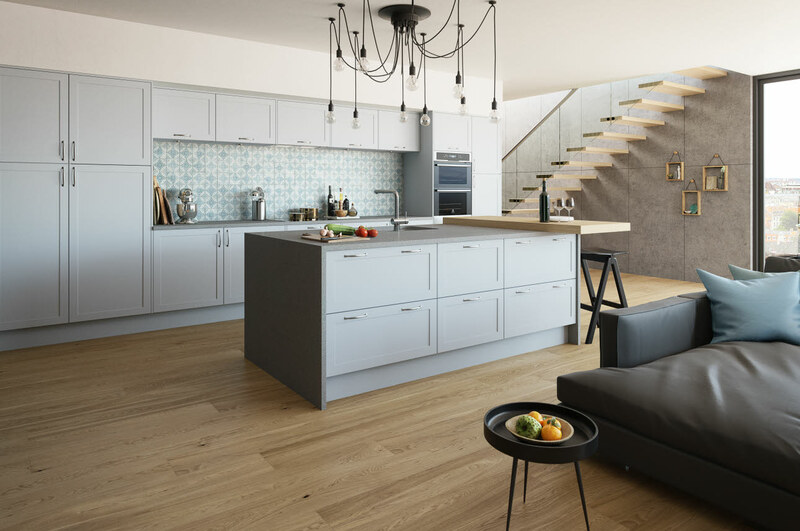 There’s everything from top of the range made to measure kitchens in our Uniquely collection, through to great value ready to assemble kitchens. 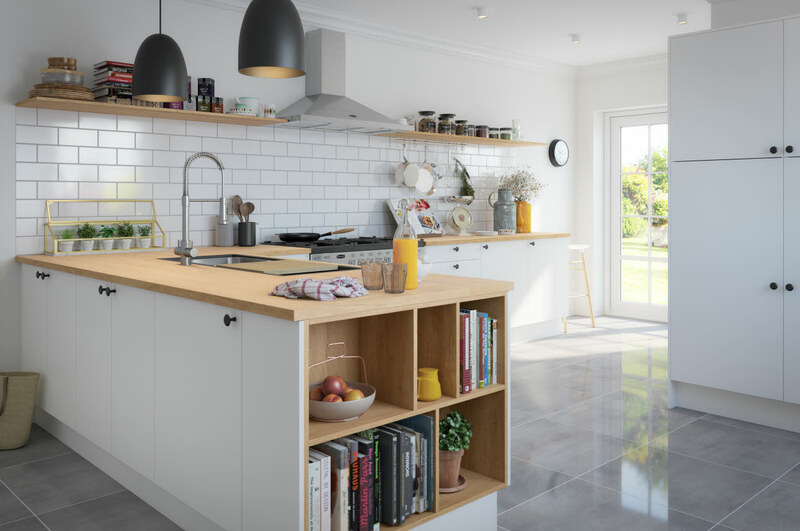 And remember, you can rest assured that every Magnet Trade kitchen is responsibly made and built to last in the UK and comes with our unique 20-year cabinet guarantee. 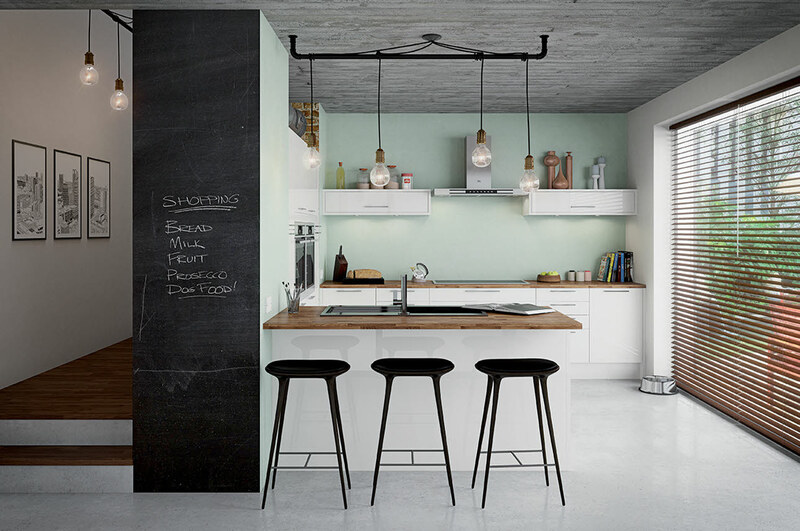 Alpine Graphite Alpine Graphite will provide timeless elegance to your customer’s home. 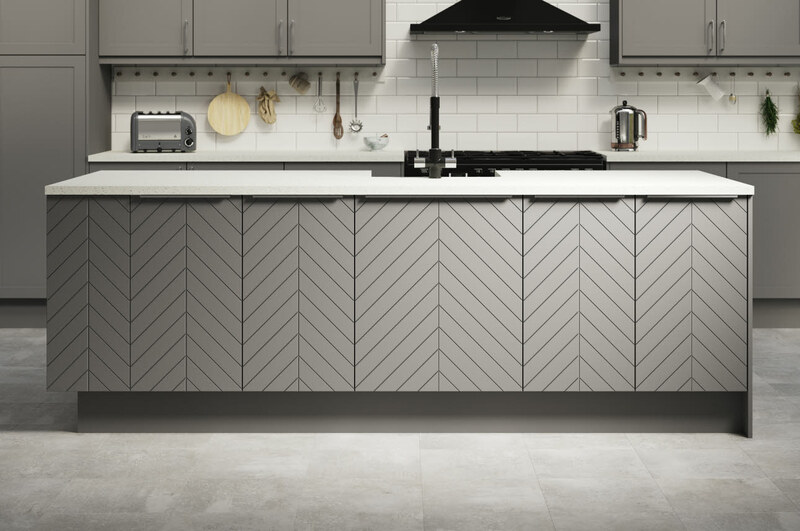 Chevron Grey The striking design of the Chevron Grey door will instantly make it the centrepiece of your home. 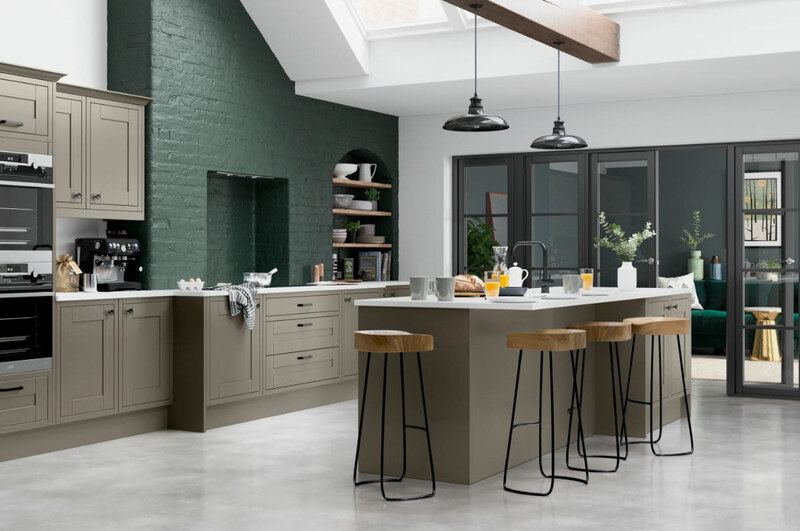 Dunham Dove Grey Dunham Dove Grey brings the promise of serenity to even the busiest of family kitchens. 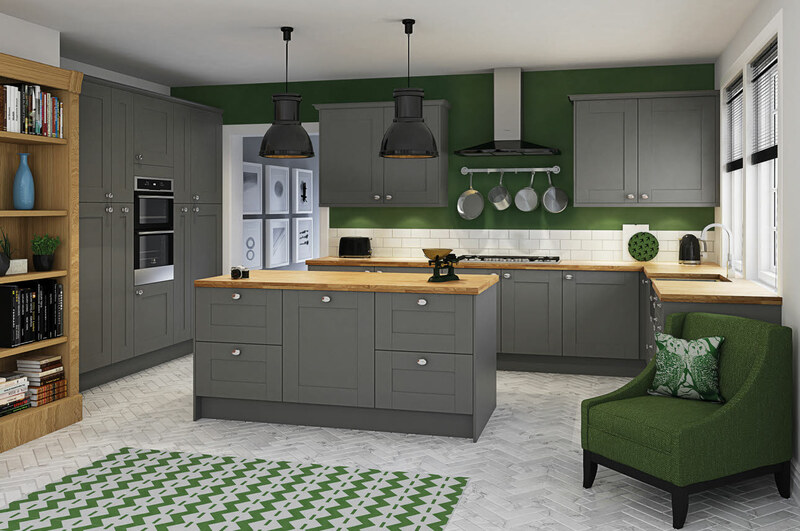 Dunham Grey This uncomplicated design gives the standard Shaker a new lease of life. 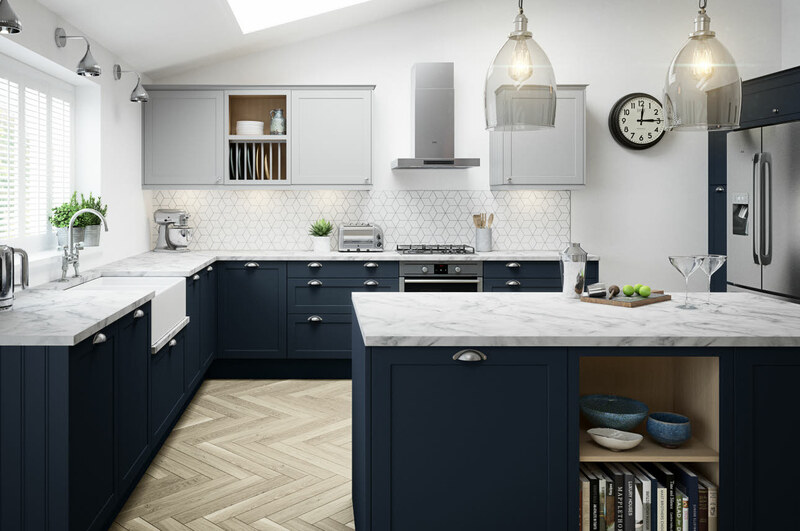 Dunham Midnight This Shaker is striking in every detail; from its bold, matt-painted blue doors to its pure white Minerva Carrara worktop. 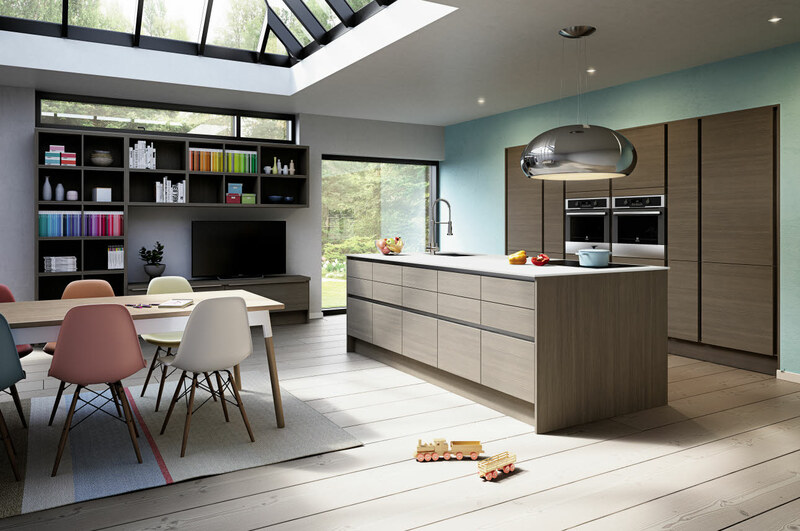 Dunham Sky The light, airy blue of this kitchen makes it wonderfully flexible for any environment. 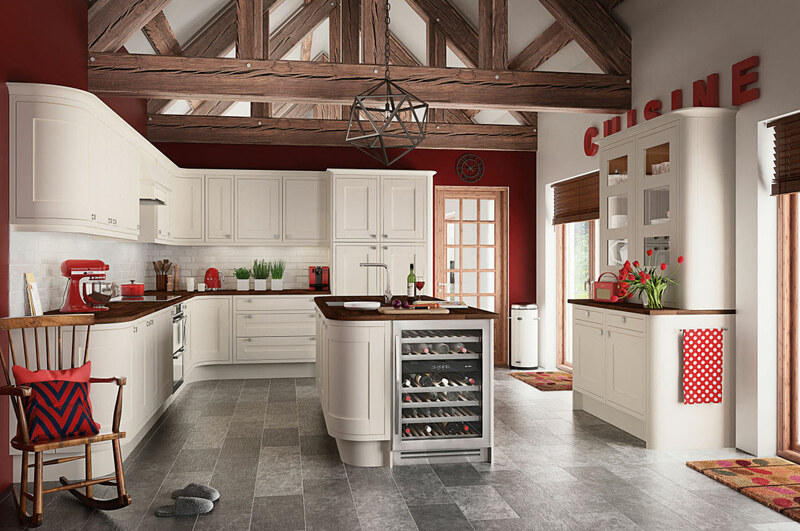 Dunham White Displaying a clean, crisp white, making it versatile for either a contemporary or traditional setting. 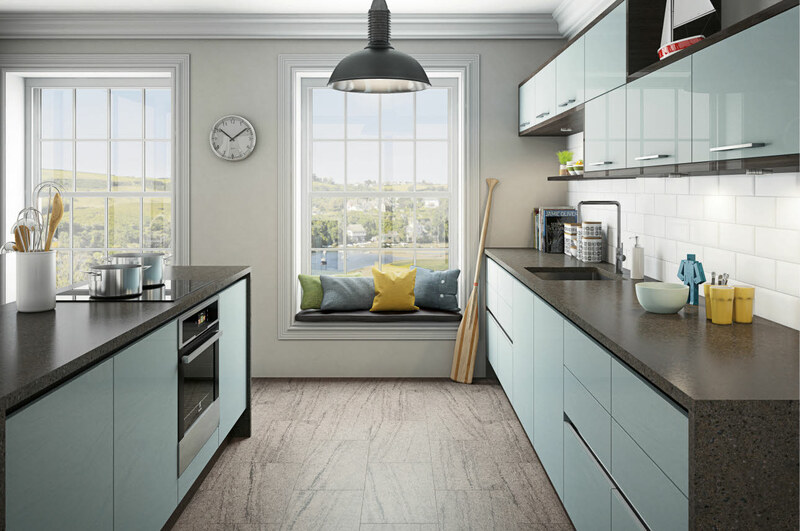 Fusion Blue Fusion Blue features an incredibly beautiful, high gloss glass effect finish. 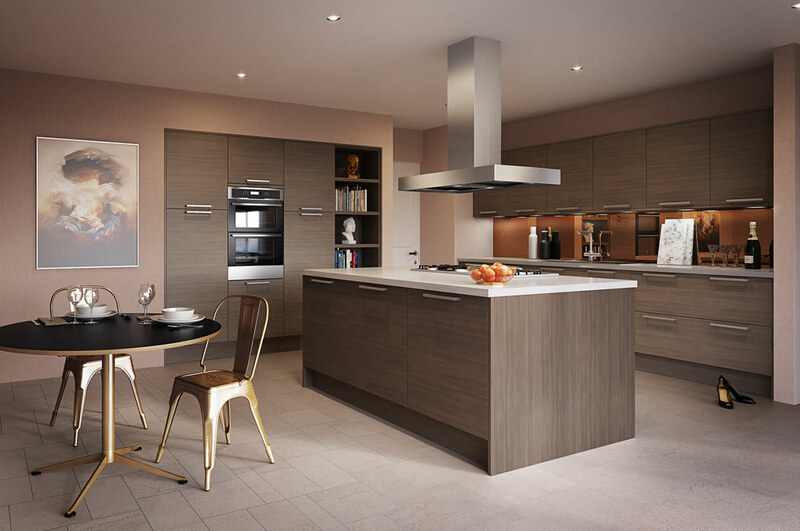 Fusion Champagne Metallic Champagne slab doors and striking duo tone silver edging makes this kitchen a showstopper. 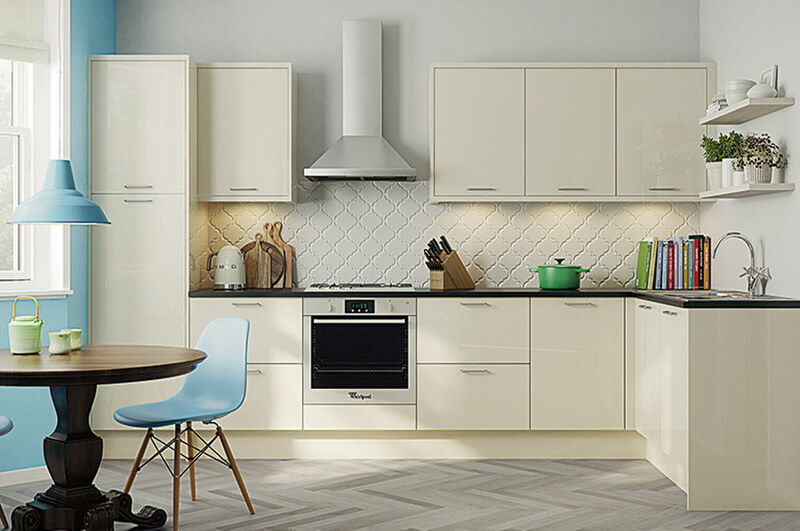 Fusion White A simple but stunning contemporary kitchen that demands attention, with its super high gloss finish and premium two-tone edging. 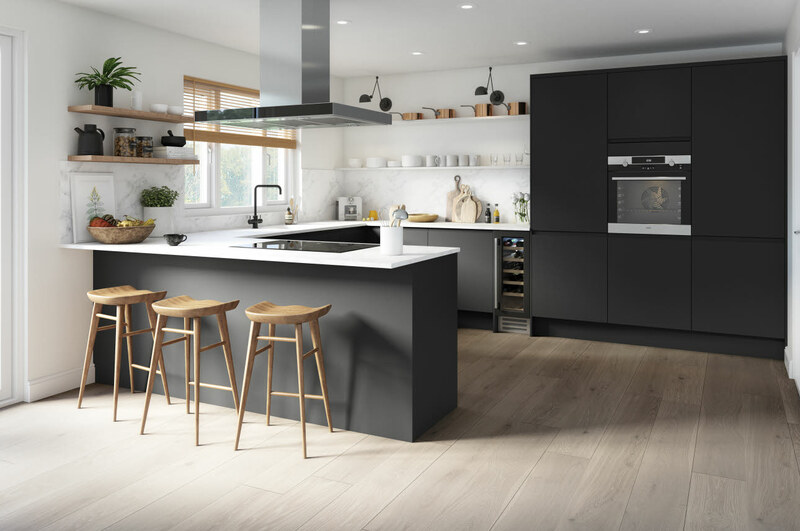 Integra Alpine Graphite This is the choice for you if you want textured wood grain slab doors, without a handle in sight. 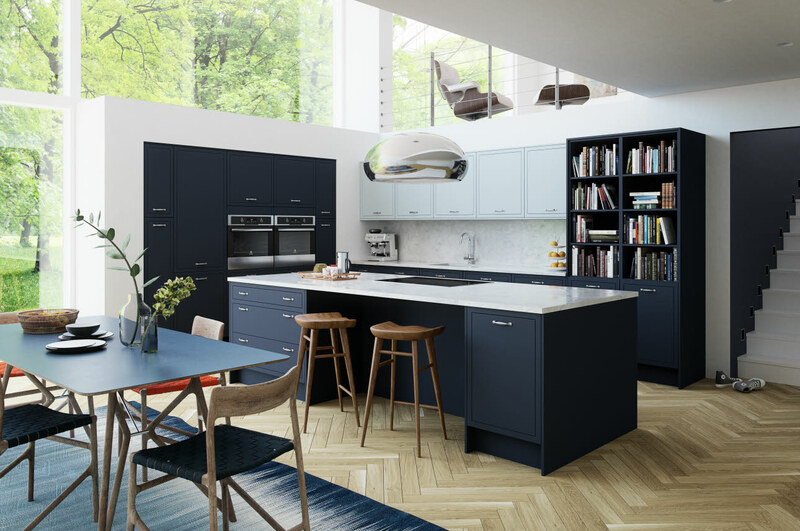 Integra Fusion Blue The fuss free handleless signature of our Integra kitchens combines with the durable, high gloss metallic finish of Fusion Blue. 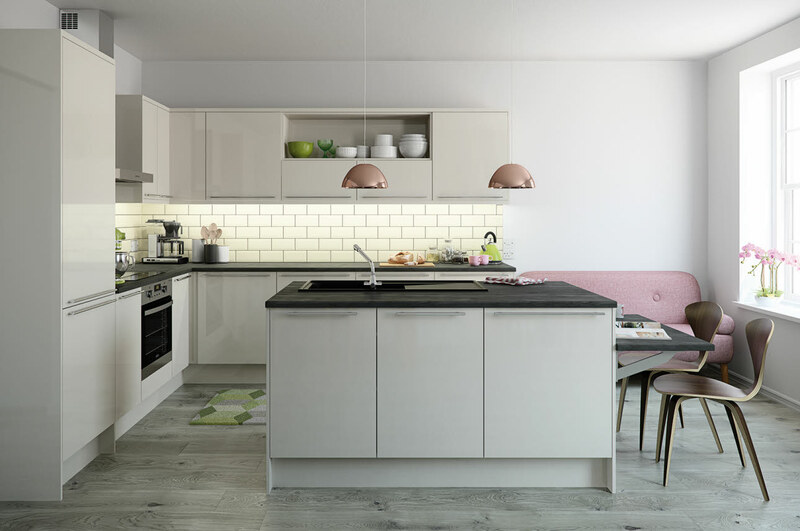 Integra Fusion Champagne This range has been stylishly designed to create a modern and simplistic look. 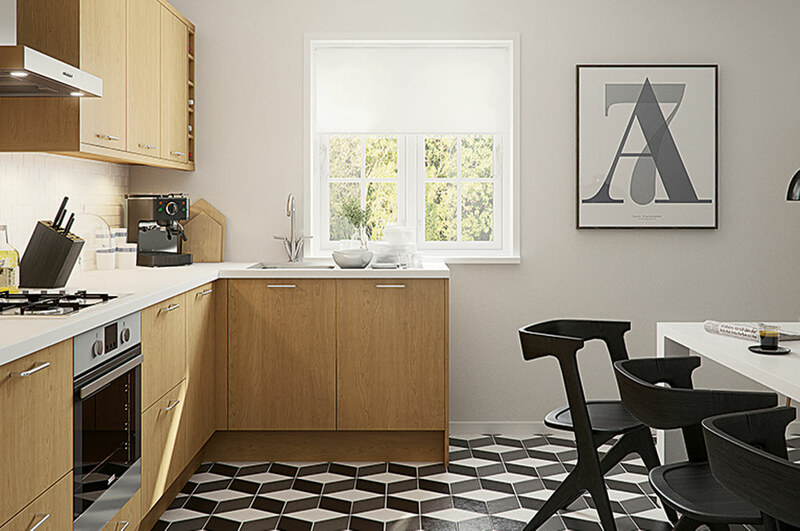 Integra Fusion White Featuring handle-free cabinets and drawers keep it looking slick and modern, with a totally smooth appearance. Integra Meteor Blue With the Integra Meteor Blue, retro meets forward thinking. 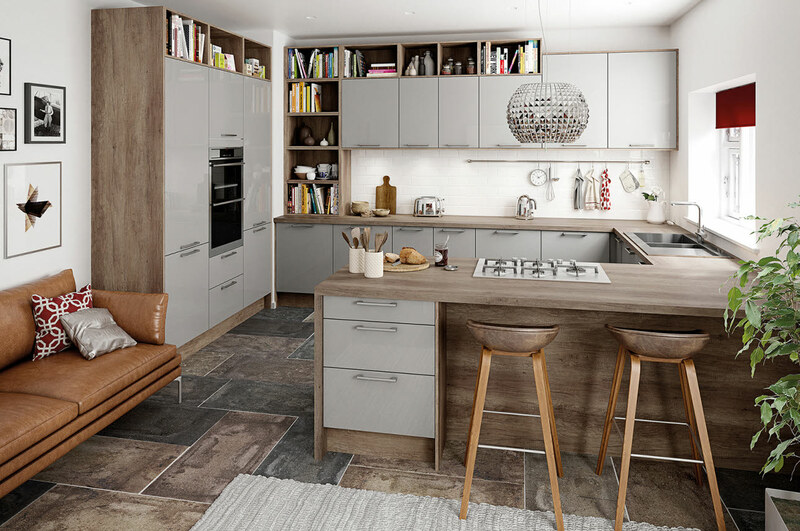 Integra Meteor Grey With subtle, yet classy design, the Integra Meteor Grey kitchen is the perfect place to enjoy drinks with friends. 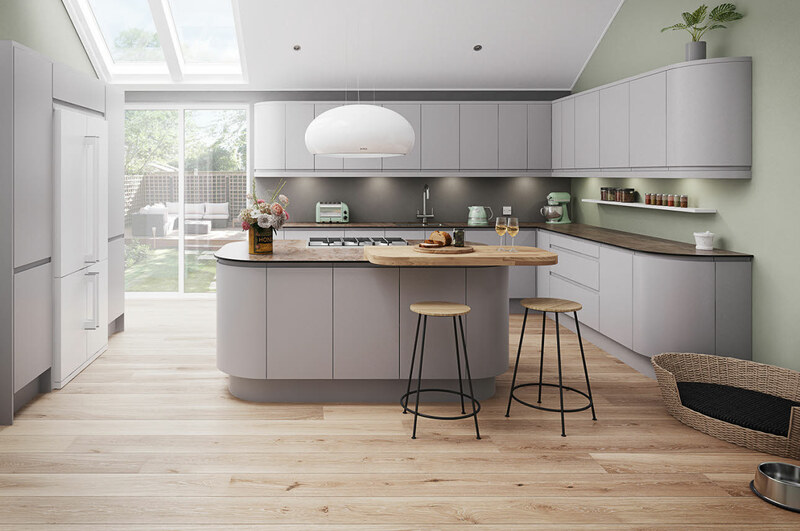 Integra Meteor Light Grey The Integra Meteor Light Grey oozes timeless elegance. Boasting a style which promises to stay in fashion, it provides the freedom to experiment. Leyburn Oak The Leyburn Oak provides a rustic space to cook and enjoy hearty meals with all the family. Luna Cashmere Retro meets forward-thinking in this bold member of the Cashmere family. 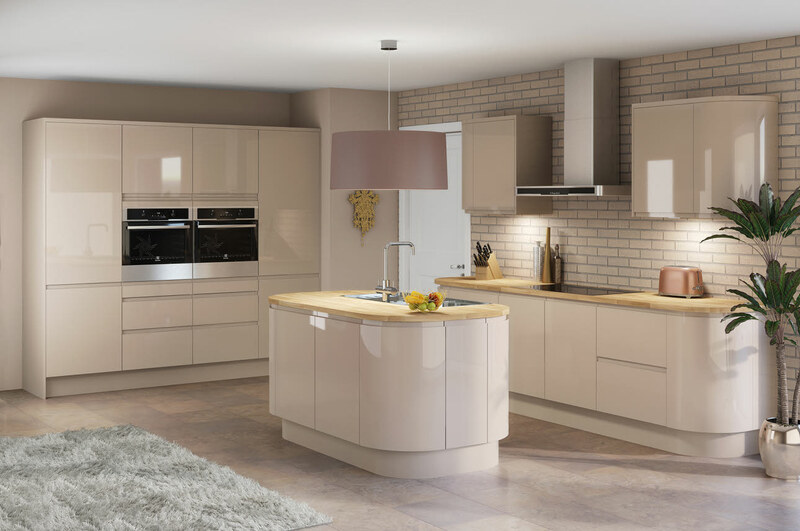 Luna Cream A stunning combination of high gloss cream and an ultrasmooth ‘no handles’ design. 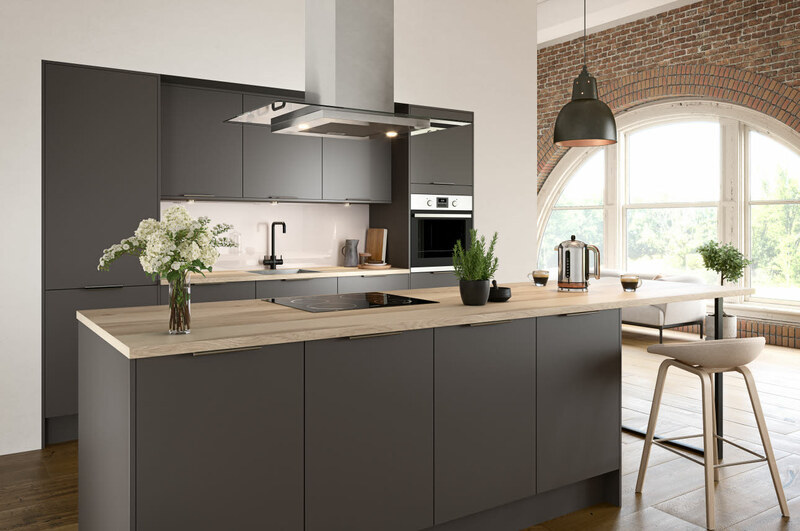 Luna Gloss Graphite With handle-less doors, this graphite kitchen is functional yet edgy. 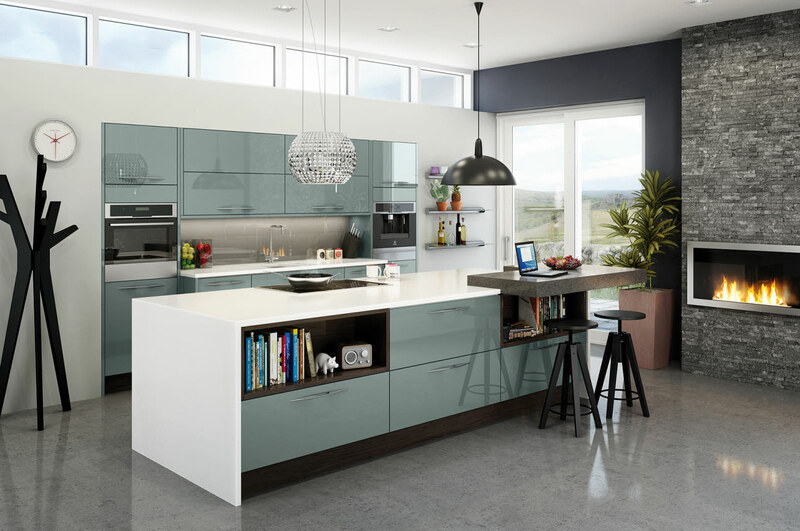 The high gloss finish creates a smooth, modern finish. 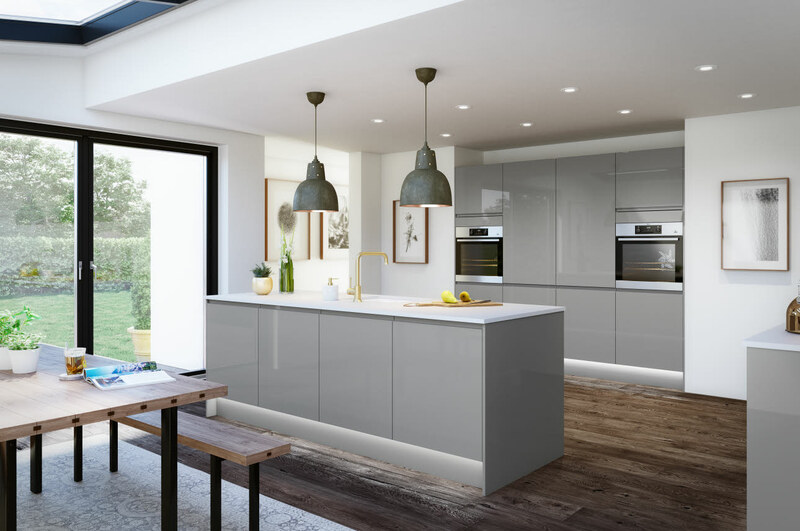 Luna Grey Integrated, almost invisible handles keep the lines smooth and clean, whilst the light grey gloss finish adds a stylish sheen. 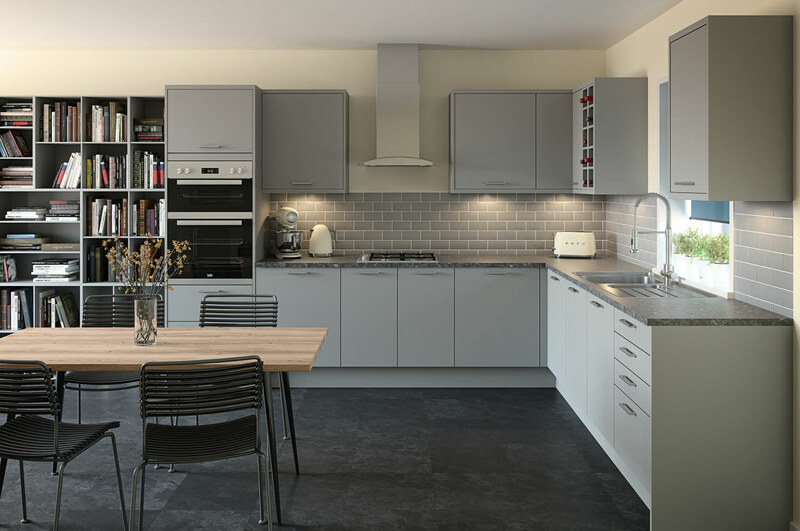 Luna Matt Grey Create a serene look and feel with integrated door handles and an uncluttered design. 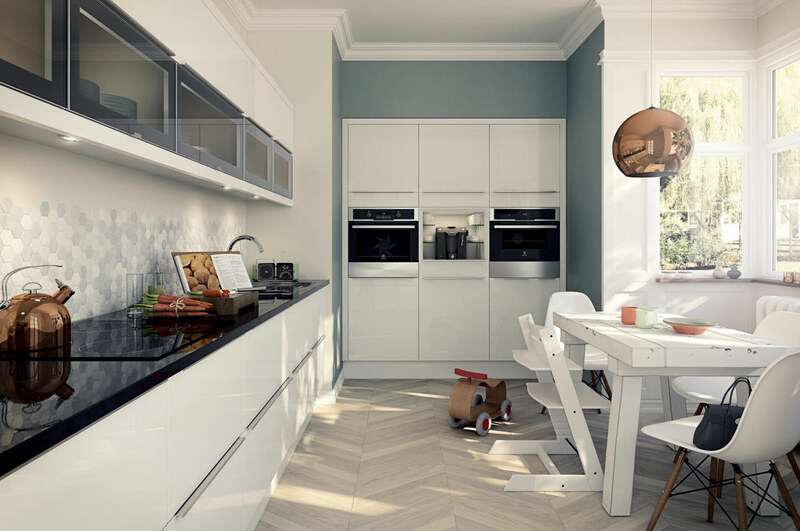 Luna Matt White With a design unbroken by handles, this kitchen is for those who love a sleek and modern finish. 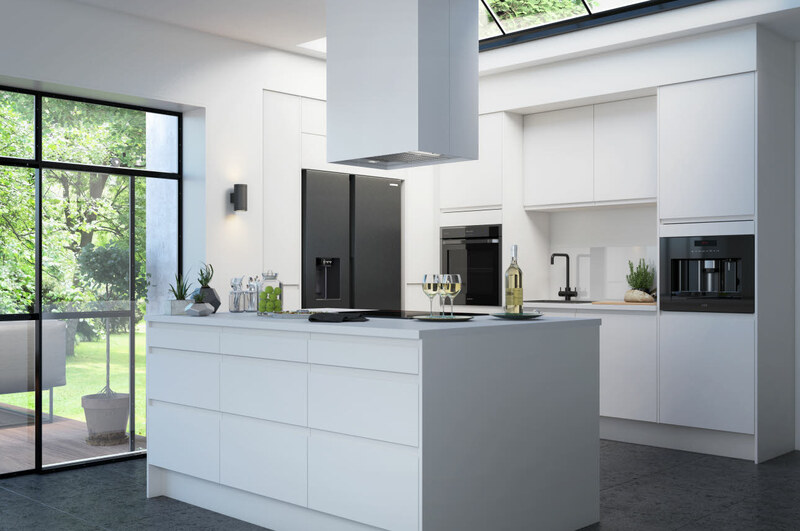 Luna White With no handles to interrupt the flowing lines, Luna’s design is as pure and simple as the white gloss finish. 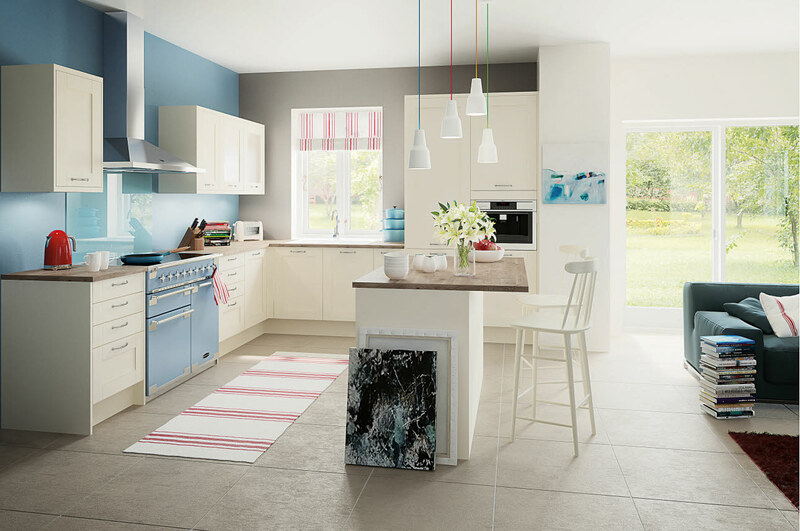 Meteor Blue A great kitchen for the customer who wants to make a statement. 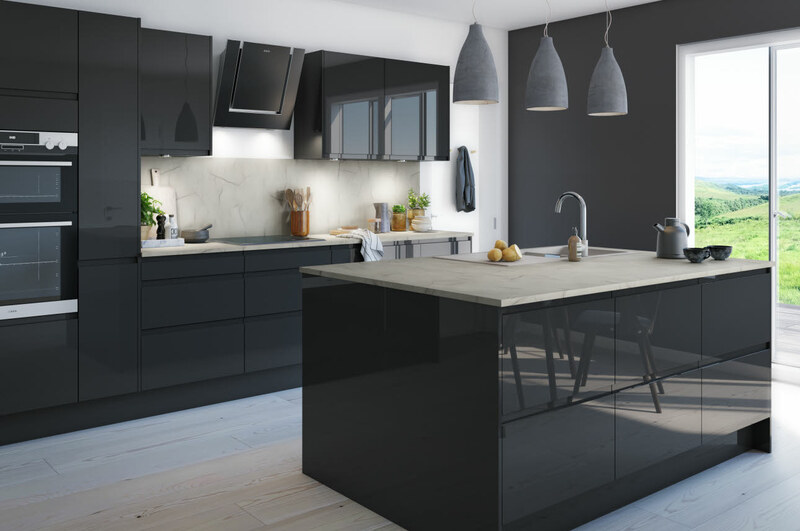 Meteor Grey The Meteor Grey design combines two of the most fashionable trends in kitchens right now - a grey colour and a matt base. 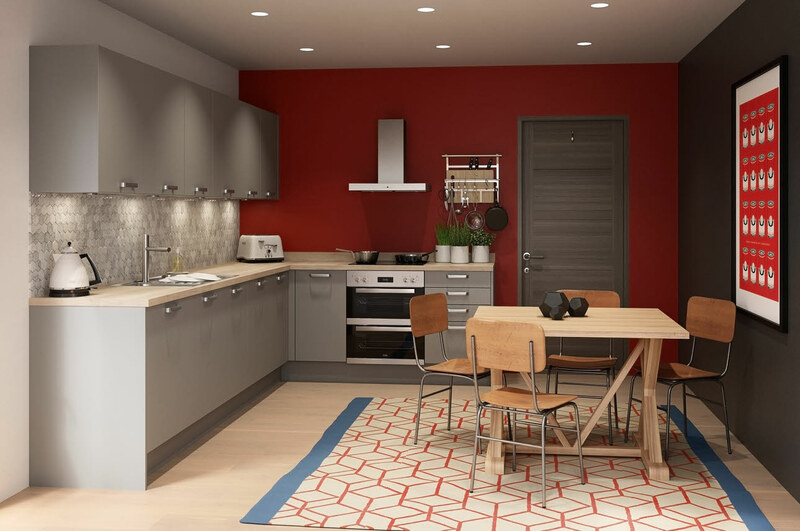 Meteor Light Grey A Meteor Light Grey design is perfect for the person who wants their kitchen to last, but also wants it to complement contemporary accessories. 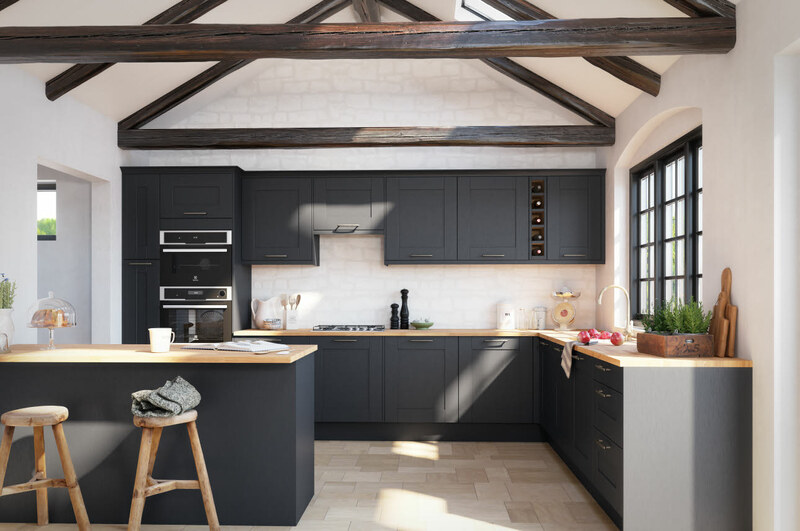 Newbury Grey With its moody, mid-grey matt finish, there’s no denying the impact that a Newbury Grey kitchen will create in your home. 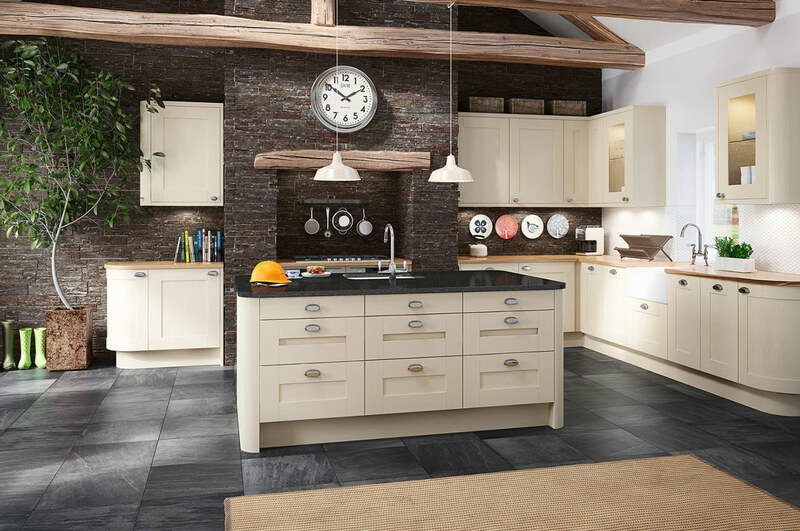 Newbury Midnight The streamlined, linear layout of this design instantly gives off a premium, on-trend feel. 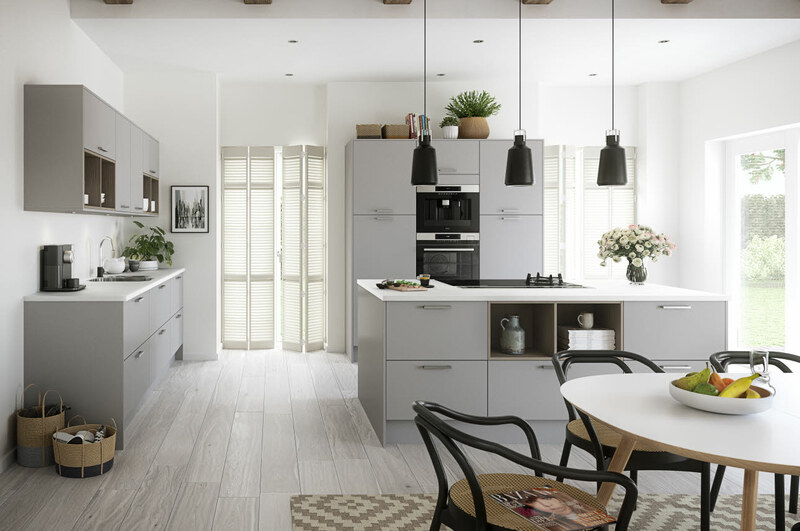 Newbury White With off-white matt finish and over-painted doors, Newbury White creates a linear look that’s stunning in its sheer simplicity. 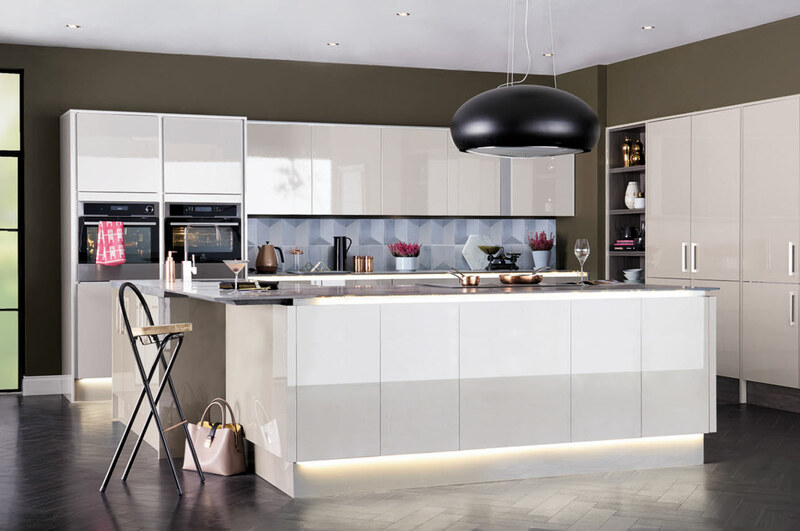 Nova Cashmere With a slab door and high-gloss finish, this kitchen stands firmly at the forefront of modern design. 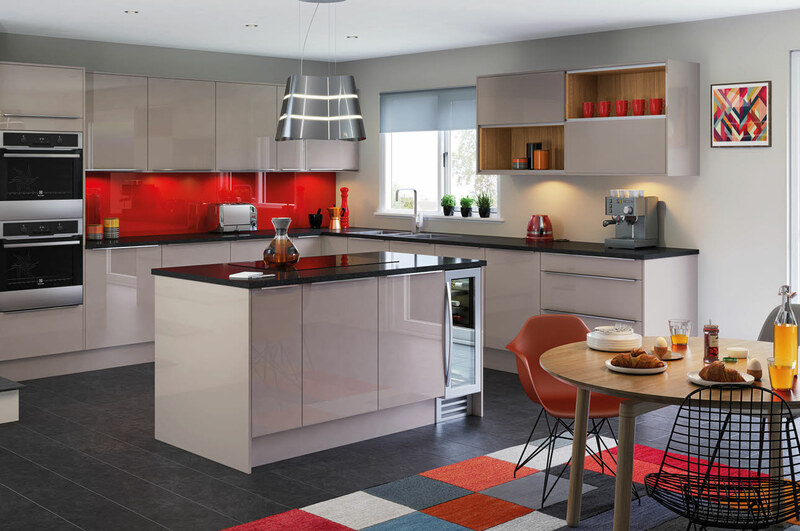 Nova Cream The neat, uncluttered styling perfectly complements the warmth of the cream gloss finish. 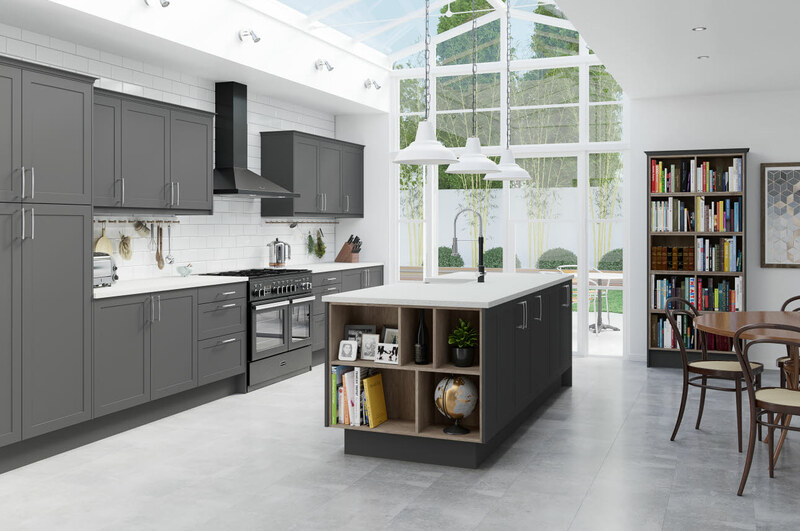 Nova Matt Grey For a contemporary finish, and practical style, the Nova Matt Grey is perfect for both form and function. 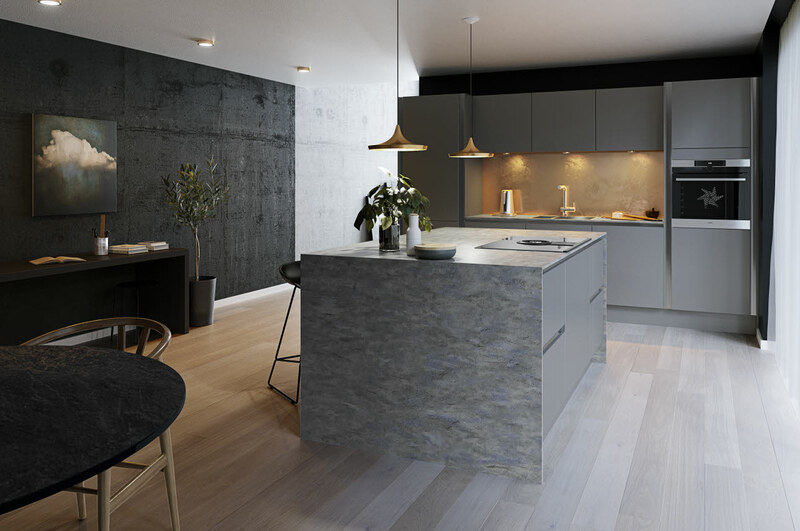 Nova Matt Slate Inspired by Scandinavian design, Nova matt slate is simple yet striking. 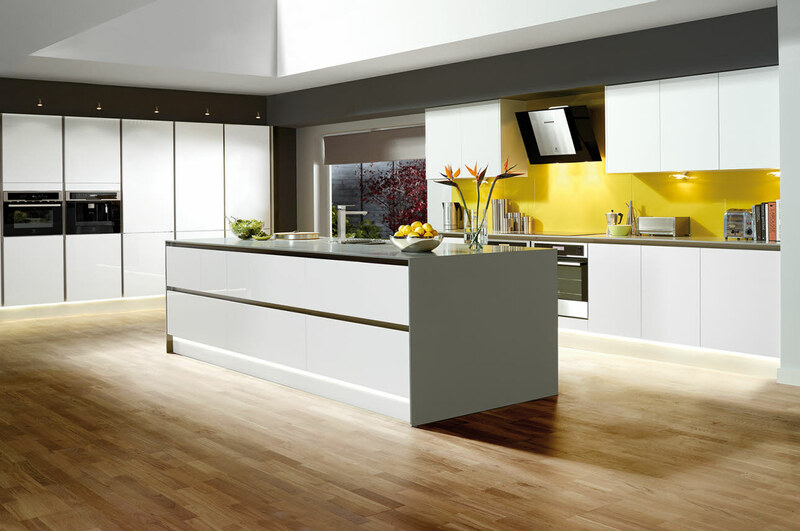 Nova Matt White The slab frontals give an elegant yet minimalistic look. Nova White High gloss white has never looked so sharp. 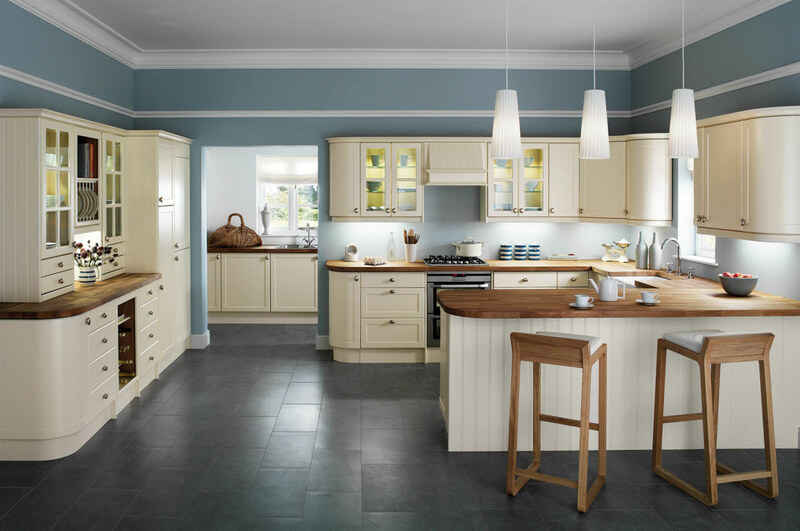 Shaker Cream This is a kitchen that looks the part, in both traditional and contemporary homes. 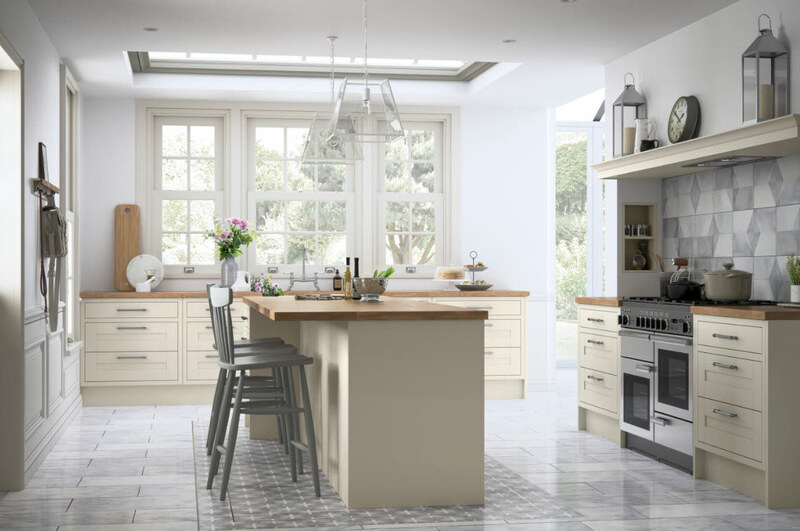 Somerton Cream The clean lines of this kitchen work perfectly with the flat frame panelling, visible graining and chunky end panels. 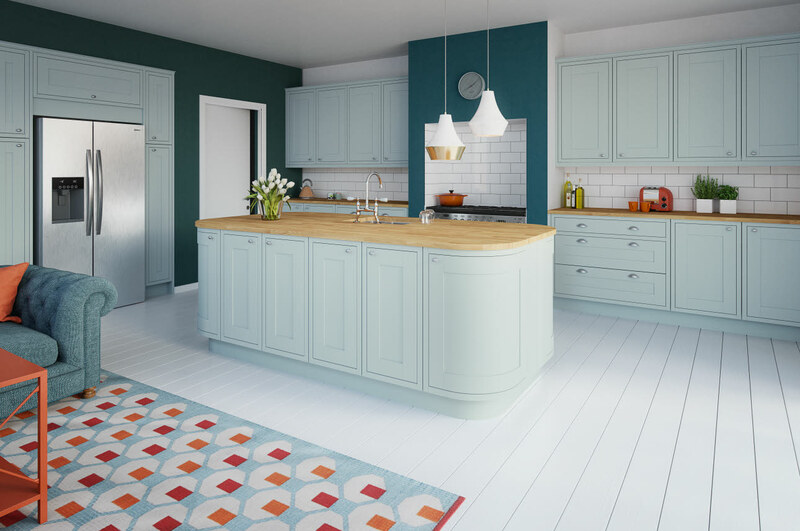 Somerton Duck Egg This Shaker style kitchen is complemented by a painted timber effect, to give surfaces an authentic, traditional feel. 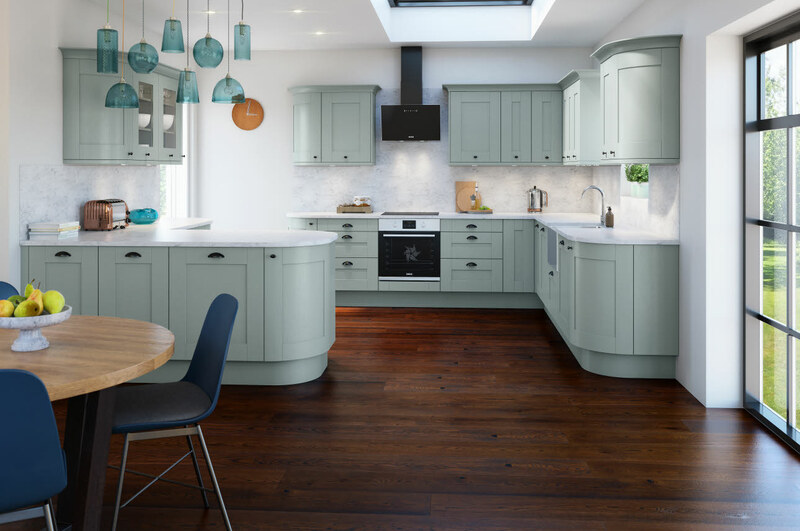 Somerton Fern The smart earthy green paintwork on the cabinets make this kitchen a good fit for both modern and traditional homes. 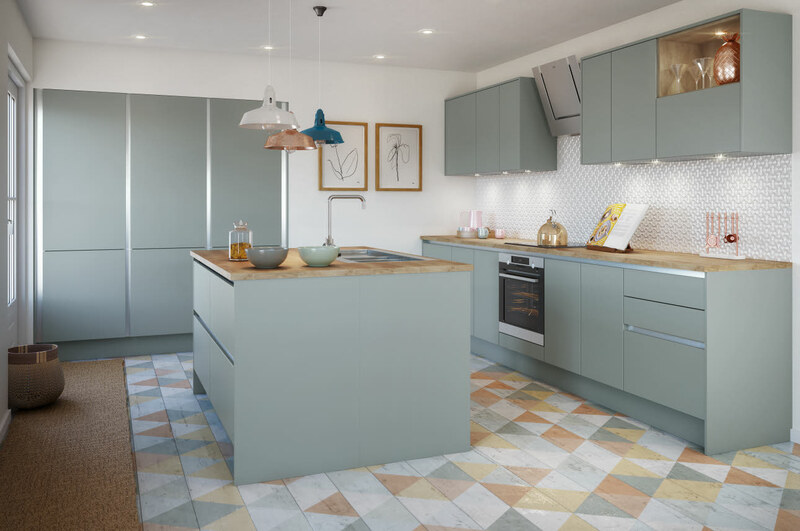 Somerton Sage This alternative to cream combines a light shade of green with a soft grey undertone. 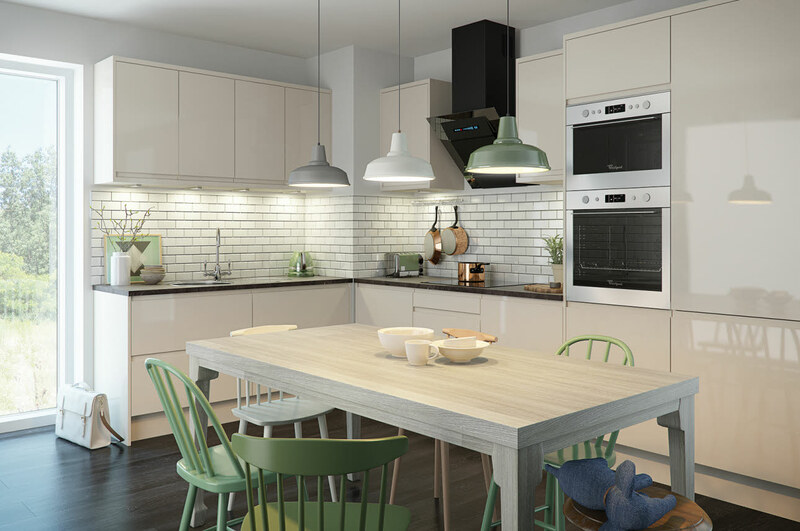 Strata Gloss Cream Taking the design from urban to something much more homely, this range creates added style to your home. 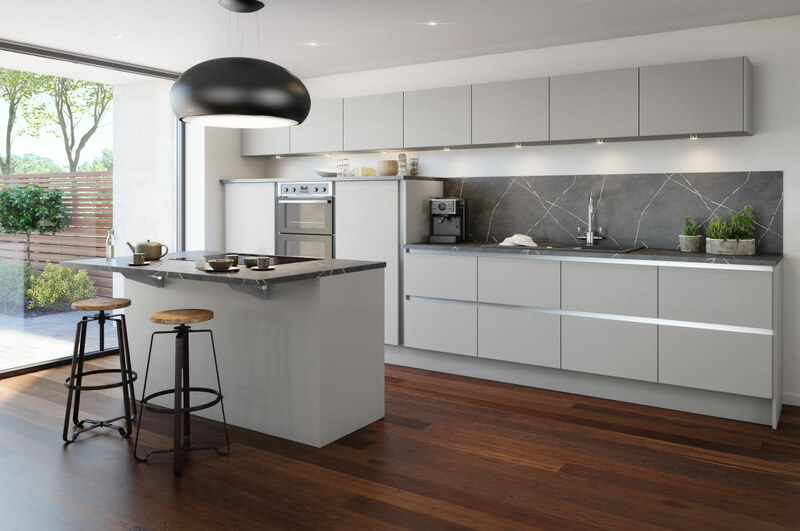 Strata Gloss White Clean lines and a subtle gloss finish combine to make this kitchen a fine example of contemporary style. 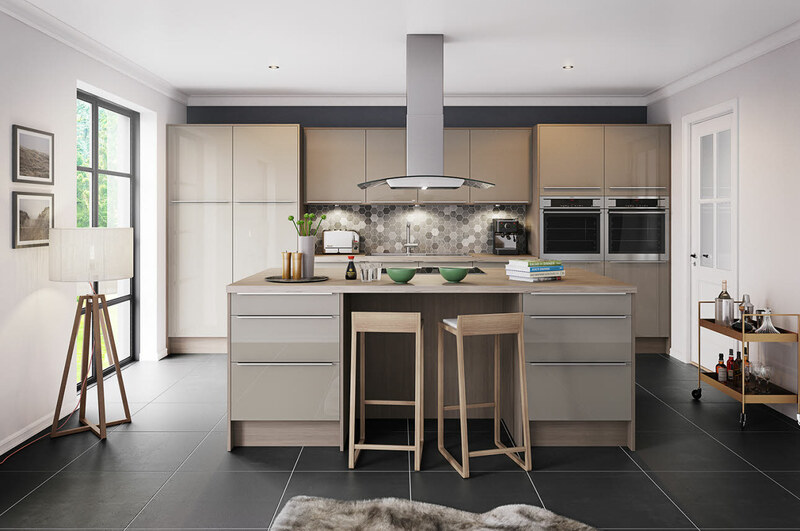 Strata Oak The simplicity of the design means it’s equally at home in contemporary or traditional settings. 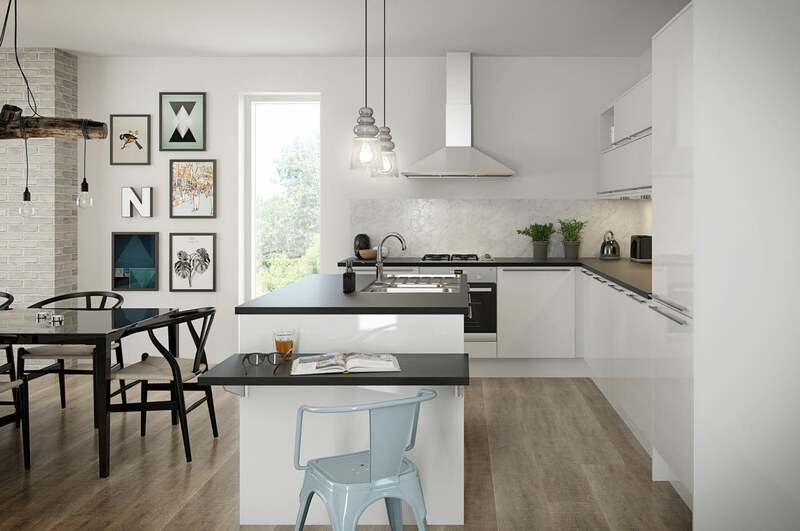 Studio Grey Bringing a pale grey gloss finish to accentuate the on-trend minimalism. 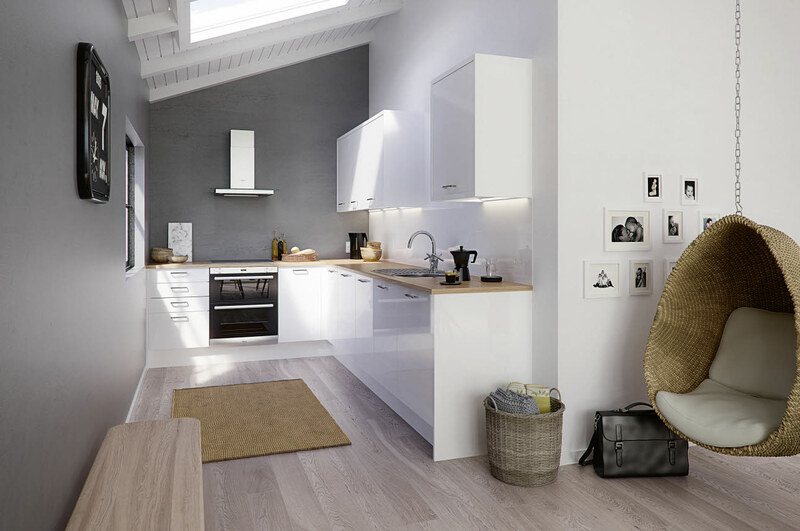 Studio White This is a simple but attractive design. 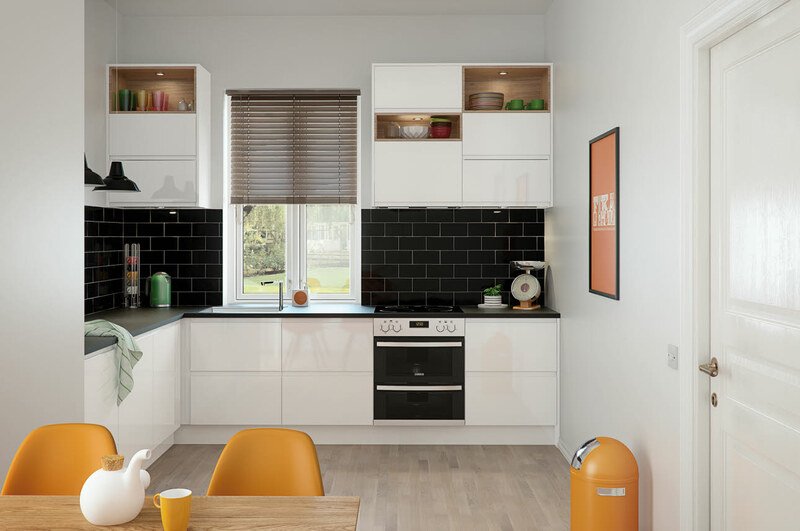 The glossy finish of the units can work perfectly alongside contrasting laminate worktops. 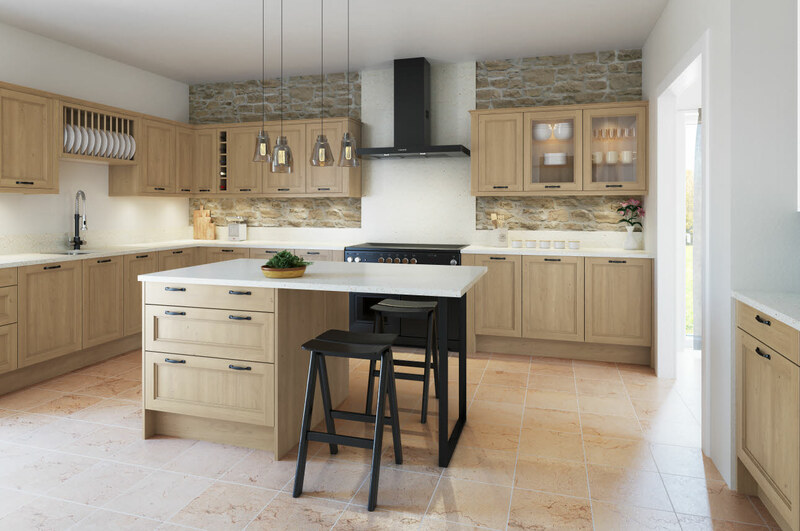 Tatton Cream This Shaker style kitchen features wide horizontal rails and slim vertical stiles, to create a more modern look. 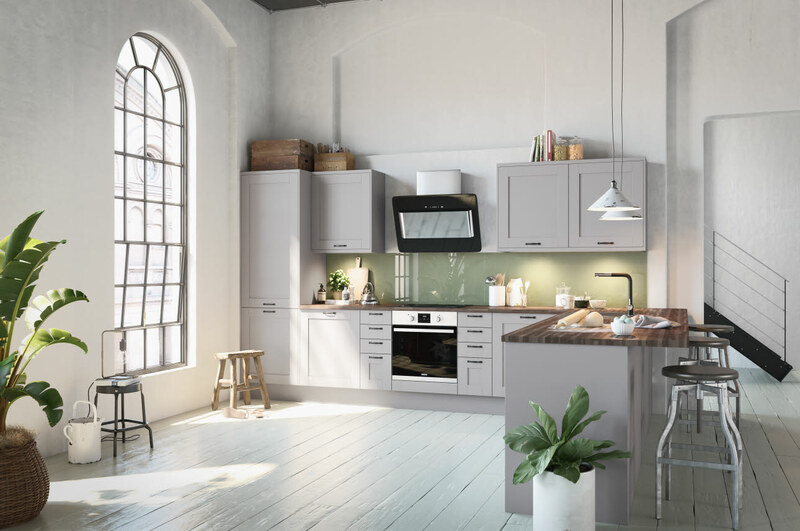 Tatton Grey The visible woodgrain finish gives the Tatton Grey a homely, hand-crafted feel, whilst the Dove Grey colour adds a modern spin. 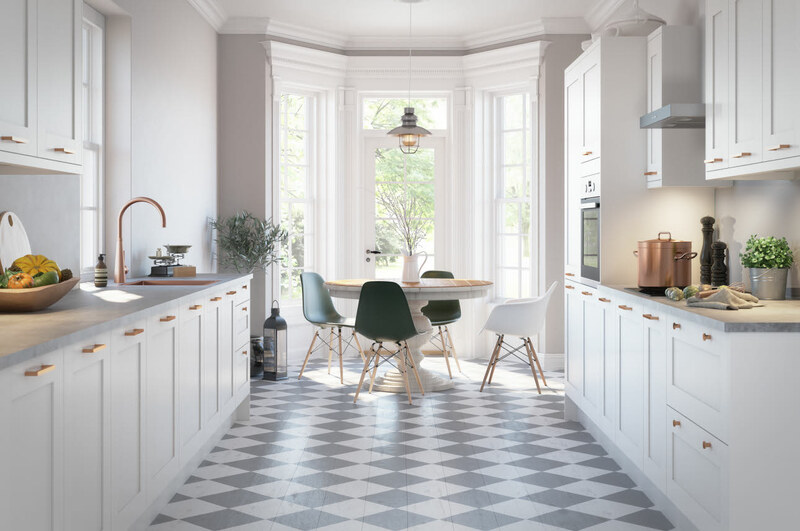 Tatton White Tatton White is the latest addition to the Tatton range – a clean and crisp white which will look at home in either a modern or traditional setting. 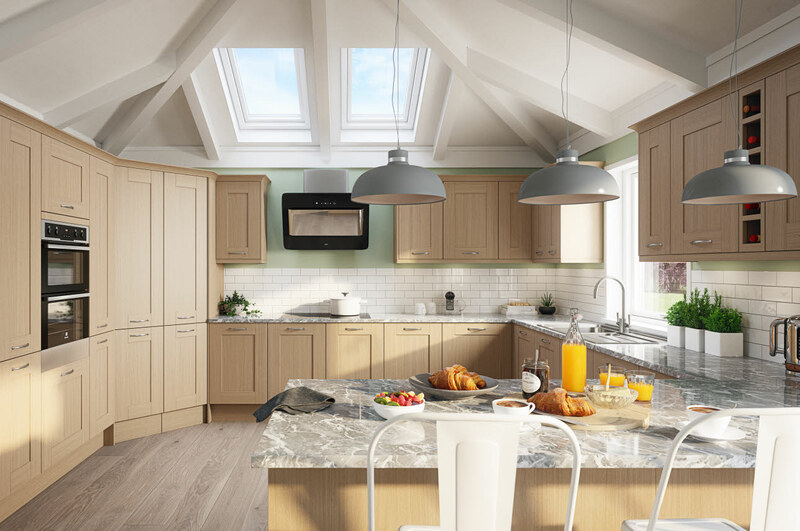 Winchester Acacia The light timber effect of this Shaker style kitchen instantly creates a beautifully crisp and clean interior. 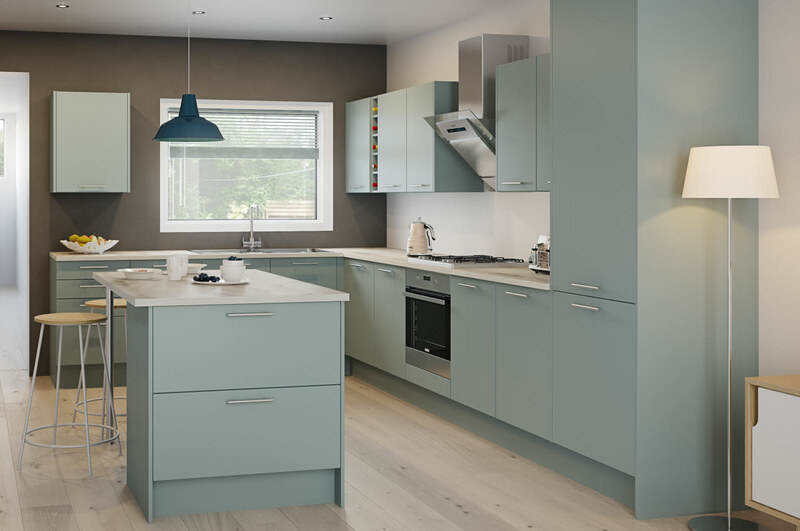 Winchester Blue The Winchester Blue with its green blue grained painted effect shaker doors is a minimalistic masterpiece without trying too hard. 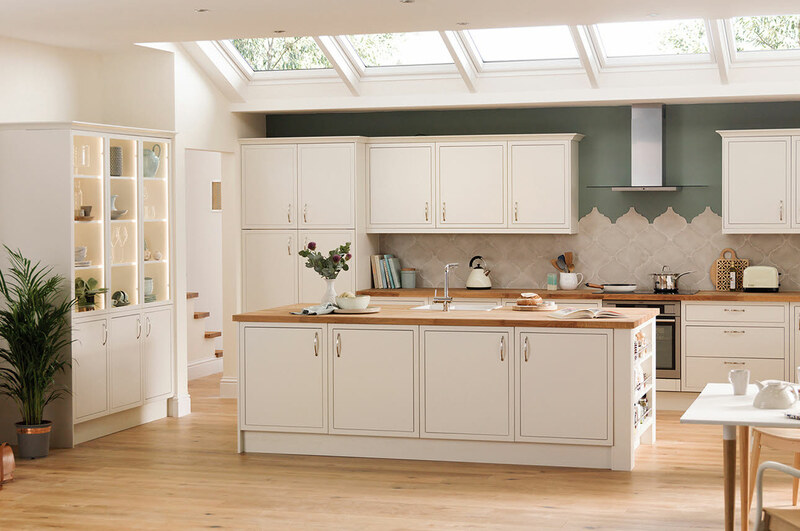 Winchester Cream This is a kitchen that displays traditional and modern influences in equal measure. 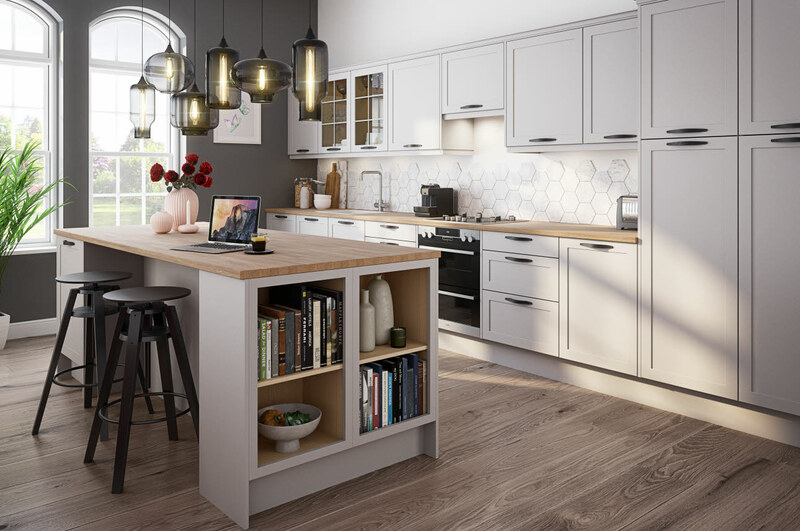 Winchester Grey Combining traditional wood grain effect shaker doors, the Winchester Grey is the perfect intersection between classic and contemporary. 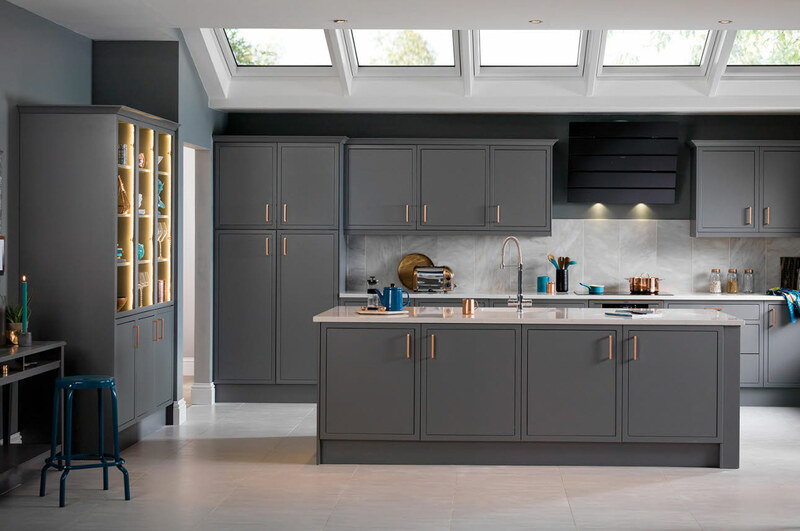 Winchester Midnight Introducing an on trend navy into our Winchester range with Winchester Midnight. 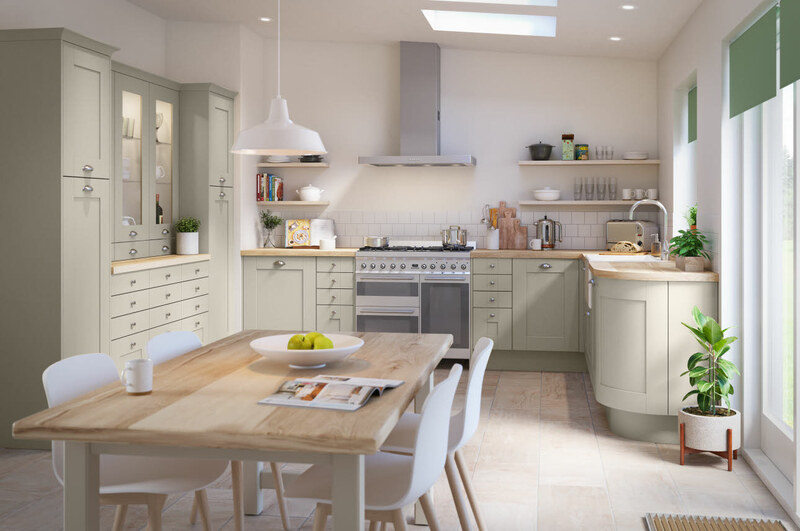 Winchester Sage Sophisticated grey finish that works well with solid wood worktops.